New Hampshire in January can be such a bummer. It’s cold, dark, and we’re all basically counting down the days until we’re back in shorts and flip flops (which oddly usually happens around 55 degrees). There’s a word in the Danish language called “hygge” (pronounced hoogah), which is essentially the art of being cozy and comfortable. It’s all about finding pleasure in mundane things like having dinner at home with friends on a cold night or hunkering down under a blanket during a snowstorm. Think about all the things that make you feel cozy and warm…cuddling up by a fireplace with a good book, snuggling with a puppy, hot chocolate after a brisk ski session. Hygge means grasping onto those things and appreciating that warm feeling it gives you for as long as you need to…so basically until April. How smart is that though?! We’re all sitting around complaining and the Danish are like guys this is freaking awesome, here’s a cup of soup! These muffins are my attempt at feeling the hygge. Anything pumpkin, cinnamon and apple always makes me feel cozy especially when warmed and served with hot cocoa or my morning coffee. This recipe is gluten free, grainless and jam packed with superfood power. The pumpkin provides fiber and vitamins, while the oats and flax keep you full for hours. 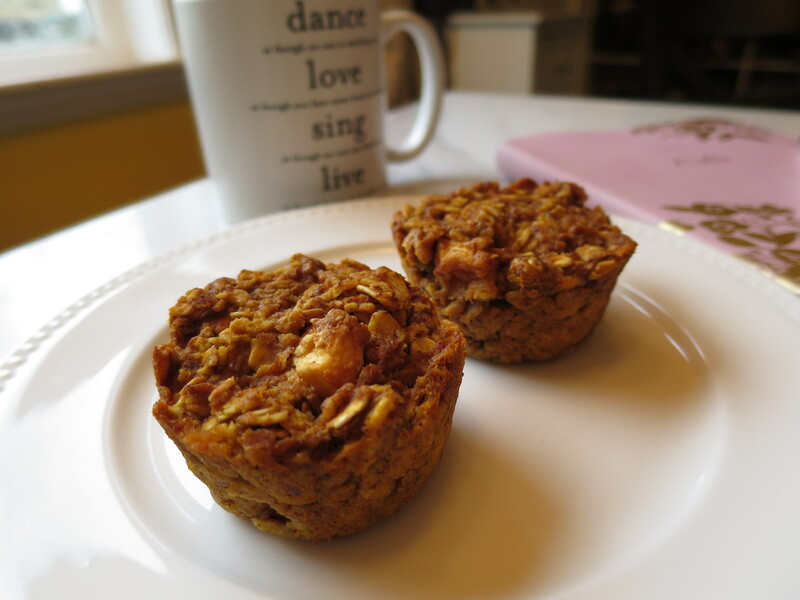 Plus you could easily add walnuts, raisins or pumpkin seeds to make it even more of a power muffin. 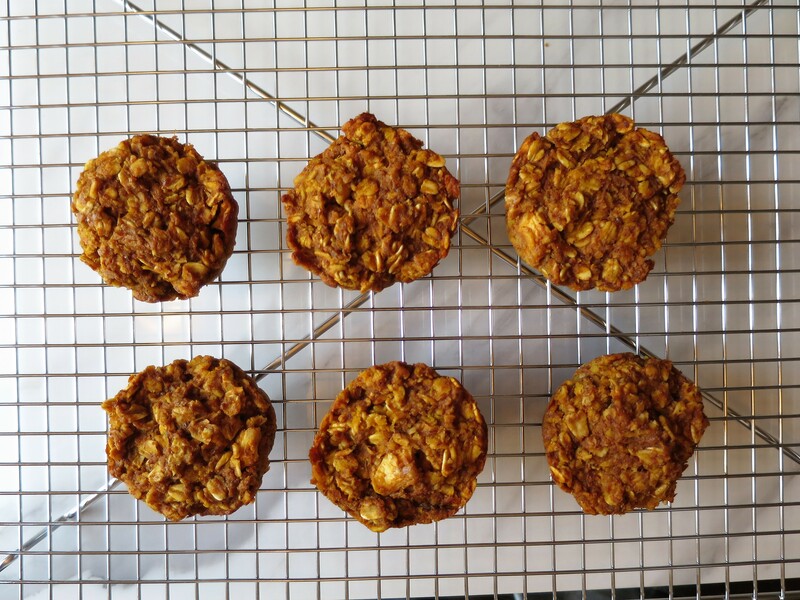 Traditional oatmeal is awesome, but baked oatmeal muffins are like the quicker, hip version. They pack the same nutritional benefits, but you can eat one as you run out the door on the way to work, or pack one for a midday snack. Directions: Preheat oven to 350 degrees. Mix together pumpkin, vanilla, egg, maple syrup and milk. In a separate bowl combine oats, flax, baking powder, salt and spices. Mix dry ingredients into wet and fold in apples. Drop into greased muffin pan and bake for 25 minutes. Let cool and enjoy! Yields about 12 muffins. My suggestion for consuming these blonde beauties is warmed and covered in peanut butter, cinnamon butter or even some cookie butter for a sweet splurge. And being cuddled up by a roaring fire with your favorite someone wouldn’t hurt either…Embrace hygge! The New Year is upon us and that means we all start to take a deep look at our lives and see what we can do better. I’m the first to admit that my pants start to feel pretty snug around the holidays and I may eat a few more (like 10) chocolates per day than usual. Getting back to healthy eating can be hard, so I like to ease into it with nothing other than cookies. These Banana Chocolate Chip Coconut Cookies are vegan, gluten free, easy and help you use the inevitable rotting banana that has been sitting on the counter for 3 days and is really starting to stress you out. Now don’t let the word “vegan” deter you! Some people see the word vegan and start running for the hills…or to the nearest donut shop. I see vegan and I think “hey, that’s probably some pretty clean eats right there and will probably make me feel good.”And it usually does, so give vegan a chance. Directions: Preheat oven to 350 degrees. Mash banana in a large bowl and add vanilla. Chop coconut flakes and add to banana mixture. Add chocolate chips and walnuts and mix well.Form mixture into cookies and place on greased cookie sheet. Form mixture into cookies and place on greased cookie sheet. Bake at 350 for 12 minutes. Flip cookies and bake for 5 more minutes. Let cool before eating so that they firm and set. These cookies are a perfect post-lunch snack when you’re reaching for something sweet. Swap the day-old office cake for these cookies for an extra energy punch to get you through the afternoon. They are jam packed with healthy oils and antioxidants so you can feel good about your afternoon snack, instead of shameful and sad (we’ve all been there). Enjoy!